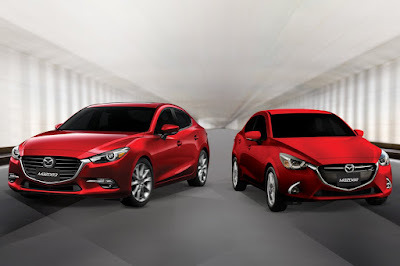 Bermaz Auto Philippines (BAP), the exclusive distributor of Mazda vehicles and parts in the country is offering deals on the 4-door variants of its award-winning Mazda2 V+ and Mazda3 R with its October Zoom promotion. Mazda Philippines builds upon its continuing partnership with EastWest Bank to make both sedan iterations of the top-selling Mazda2 V+ and Mazda3 R available through three special schemes this October. Customers may choose either a Low Monthly at 50 percent downpayment under a 60-month term option; a Free Amortization for 2 months at 30 percent downpayment under a 60-month payment plan; or an Interest Free route for those who will purchase at 50 percent downpayment, under an 18-month term. Discounts also apply for straight cash payments at the showroom floor. Both models come standard with Mazda’s latest G-Vectoring Control which allows for smoother driving and less fatigue over long distances for both drivers and passengers alike. Moreover, the CX-3 FWD Sport and the BT-50 4x2 M/T are likewise covered by the ongoing All-in/Low Down Payment option included in the October Zoom campaign. With this October Zoom promo, BAP aims to add to its current 3,254-unit sales mark as of September 2017. This is a 12.5 percent higher year-to-date figure compared to that of the same period last year.